Onto our next challenge! 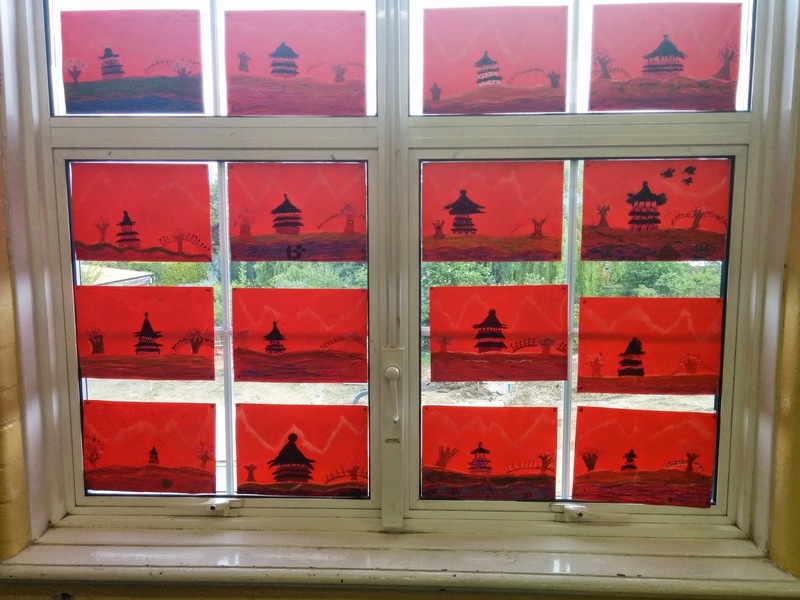 One of the mountains used as a table name in class is Mount Fuji and it's accompanied by a lovely image of Japanese fields with the mountain in the background. Japan had sparked some interest so I thought building on that would be an interesting experience for the class. This seemed like a wonderful idea but I had no idea how to go about it with a class of 30 children. I played around at home over the weekend and eventually came up with using chalk as this would eliminate the problem of waiting for paint to dry. Although the chalk came out well, it really did get everywhere and the chalk supply at school is rather limited. The compromise was to use chalk for the mountain effect and oil pastels for all of the other details. 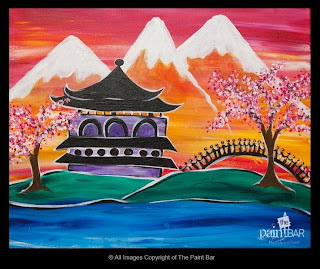 I showed the class pictures of Japan and focused on the symbolism of blossom, bridges and pagodas. It captured their imagination instantly and they were very eager to try out their own Japanese garden. 2. Paperclip the top half of the card onto your red paper. Draw another line along your mountain line and colour this section in with a thick layer of chalk. 3. Use your finger to smudge the chalk down onto the red paper. Make sure you work your way across the line but keep smudging it DOWN. Once you've gone all the way along just take off the white card and you're left with your chalky mountains. 4. To produce your water/grass parts, first draw a blew wavy line and blend together different shades of blue and purple. 5. Then add your layer of green on top. Use white to frame the edges of the landscape and create hills if you want. 6. 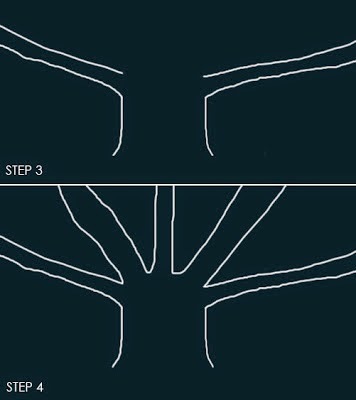 Add blossom trees with small strokes. Start with the deeper purple and work your way up to light pink/white. 7. Draw your pagoda with black pencil to ensure your shape is clean. It can be quite fiddly drawing with pastels! 8. Colour in your pagoda. 9. Add a bridge and any extra final finishing touches. You are the left with a beautiful Japanese garden being overlooked by mountains. Although this was quite prescriptive (and that's not how I usually like to do it!) 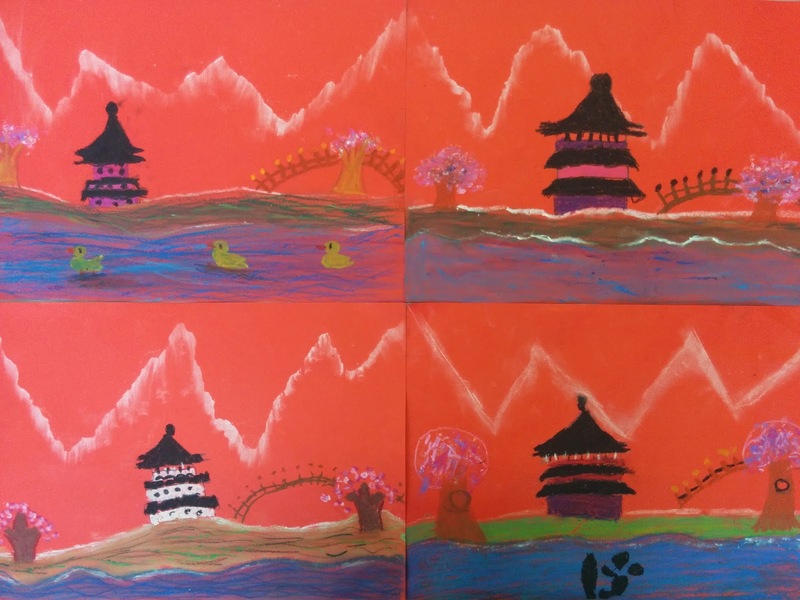 I was very happy to see some children adding their own touches like different shapes for their pagodas, variations on the trees and bits of wildlife. In other arty news, I went to a Pop-up Painting event the other night in Richmond with a friend. Neither of us are exactly artistic prodigies but we had a brilliant time. The people were really friendly and the evening was lovely. There were about 20 adults sitting in a room above a pub with a class led by a professional artist. The piece of art we were using as our stimulus was Girl with a Balloon by Banksy. Mine wasn't coming out how I liked and started to look like a stormy sky, yellow cliffs, red-ish sand and a blue ocean. Therefore, I changed my tactic and put the girl with her lost balloon standing on a balcony overlooking the scene. I highly recommend the night for an evening that's a bit different. I know that these have been done a billion times by all your art teacher bloggers, but I've always loved the pictures that pop up on Pinterest and think, "I've got to do that some day!" Today was the day I could finally squeeze this into one of our topics (albeit tenuously). As you know, we are studying mountains this half-term and I am doing all I can to find mountainous artwork projects. I found that the Banyan tree is the national tree of India (where part of the Himalayas stretch into), LINK FOUND! I know it's not the most solid of connections but we can't just draw mountains every week. Also, the results are so beautiful that they're worth slightly bending the rules for. The Banyan tree project has been taken out of a book called "Dynamic Art Projects for Children" which is currently sitting in my cupboard. One of the amazing art blogs that has features this project is 'Artisan des Arts' run by Aly Marcotte. A link to her results can be found here. 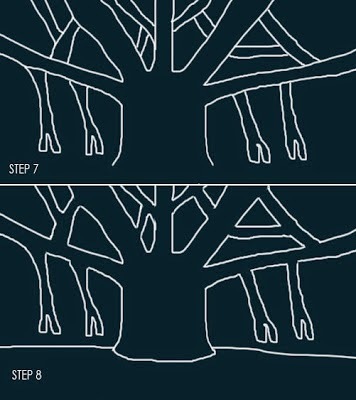 Thankfully, she also included a very clear step-by-step process for drawing the tree itself found here. 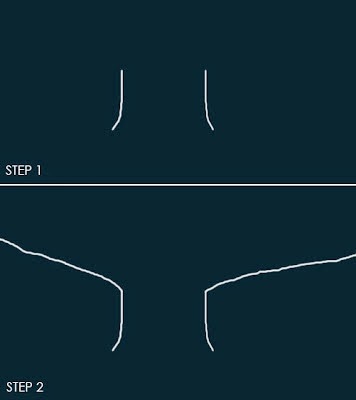 I've copied and pasted the tutorial into this post below too so you can follow along. I showed the children lots of pictures of banyan trees and discussed their significance to India. They're particularly interesting because roots actually grow down from their branches into the ground. I showed the class the colour wheel and explained that analogous colours are colours that are next to each other on the wheel. 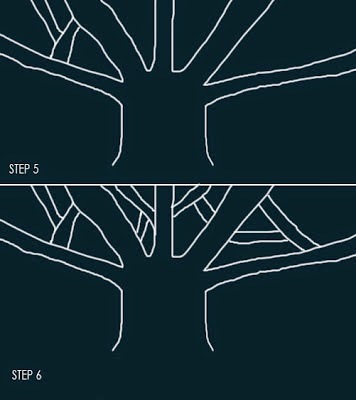 They were then instructed to fill in the spaces between the branches with 2 or 3 analogous colours blended into each other. They had the freedom to choose any particular colour scheme they wanted or they could just go the random approach. In the space between the branches and the water, children had more freedom for different patterns and designs. Some wanted to go for a misty blue stripe atmosphere, many were keen to do different sunset pictures. In the water section, I demonstrated how a range of different blues, purples, greens and white could be used to create a watery effect. 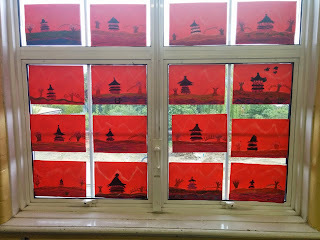 I then showed how reflections could be made by drawing black zig-zag lines. I've definitely said this before, but this is a big contender for my favourite art project of the year. 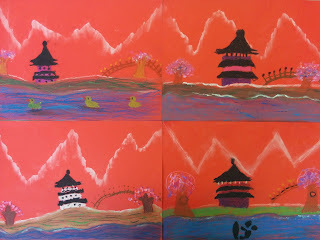 As our art co-ordinator, I do everything I can to source interesting projects that the children can be successful with. This ended up being a highly successful activity for all children. Some of the year group got a bit confused in stages (colouring in the tree with colour instead of the background, colouring the tree white etc) but they still turned out beautifully in their own way.